Thank you so much. I could not decipher the name on the LADBS building permit. So there were four theaters on the east side of the 200 block of S Main? That sure sounds a lot more fun than what’s there now. tovangar2: The 1910 project at 266 S. Main was the Liberty Theatre. The Electric Theater had its name changed to the Lyric when they added “refined vaudeville” acts to augment the motion pictures. An LA Times advertisement from July 20, 1903 lists the new name, with T.L. Tally identified as manager. According to some sources Tally sold his theater around this time and spent the next year on the road, presenting a print of “The Great Train Robbery” around the country. So the Electric appears to have been exclusively a motion picture theater for a little over a year, from on or about April 17, 1902 until on or about July 20, 1903. 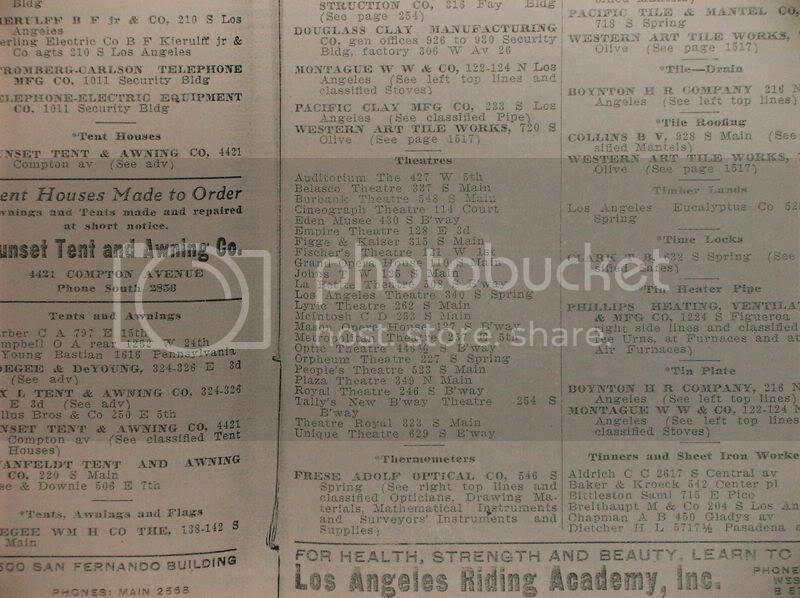 Here’s a photo of a 1908 LA city directory. This was posted by another user in the discussion of the Optic Theater. Here, the Lyric Theater is listed, so it was already going by the Lyric at that date, and had not yet become Glockner’s. Didn’t seem to be Talley’s Electric Theater for very long. As the site of the first motion picture theater, this location should definitely be hailed as a landmark. A new garage for the LAPD motorpool is being built on the site. As a concession to the neighborhood residents, some retail stores are being placed on the street front. A nice brass plaque commemorating the location’s history would fit nicely on the building. Right now, it’s just a broken old sidewalk. Recognition of the site’s history would add more to the neighborhood, maybe even more business for the Imaginasian Center across the street. Everything on this side of the block between the cathedral and 3rd Street has been bulldozed. FOR SALE-BUY SOMETHING TO MAKE money with, selling out a prices to please anyone, phonographs, kinetoscopes, picture machines, projectoscopes, electric fans, electric motors, reostat, fine oak record cabinet; sheet music 5 cents per copy. TALLY’S, 262 S. Main st. This almost sounds like one of us…. This suggests something which could have come between variety and movies. I cannot verify this for nothing remains of the theater. There is no clue, neither footprints in the cement sidewalk, nor dainty slippers suitable for drinking champagne, nor black lace drawers to dance the can-can in. Perhaps had I searched for an alley and a stage door, I should have learned something. Can some Times reader explain this mystery?